The Live Download Series kicks off with a group that's never seen the light of day on record, but consists of a combination of longtime friends and then-new acquaintances, who would go on to become regulars in the ensuing years. 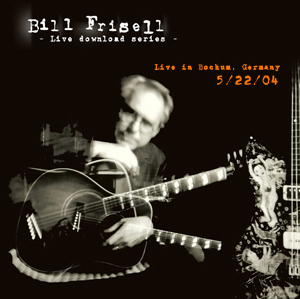 2004 may have been the year of Unspeakable (Nonesuch), Frisell's Grammy Award-winning, turntable and sample-driven collaboration with producer Hal Willner, but there's none of that album's material to be found on this performance with Jenny Scheinman, cornetist Ron Miles, bassist Viktor Krauss and drummer Matt Chamberlain. There's the opportunity to hear an early version of the vamp-driven "Lazy Robinson," which wouldn't appear on a commercial release until 2008's History, Mystery (Nonesuch); and a lengthy version of "Blues for Los Angeles" that, with Miles' recklessly visceral opening solo, transcends the original trio version on 1998's Gone, Just Like a Train (Nonesuch), and also suggests why, with his lazy, behind-the-beat drumming, Frisell would reunite with Chamberlain for 2007's experiment in sonic collage, Floratone (Blue Note), that's due for a second installment, sometime in 2011.